When Robert Kurz, founder of Prodigy Instruments, was searching for a partner to make his high-quality student instruments, Eastman Strings was a natural choice. Today, the instrument and bow-making shops that build Prodigy string instruments, under an exclusive agreement with Eastman Strings, operate in precisely the same manner as those in late 19th century Europe. They use virtually no power tools aside from band saws used to cut out the necks. Chisels, knives, gouges and scrapers in the hands of gifted craftspeople are the only tools used to create your Prodigy string instrument. In 1992 Qian Ni, who had come to the United States from China to study music, founded Eastman Strings. His company began buying string instruments from European-trained Luthiers in his hometown in China. But before long, he and his colleagues saw that a better system was needed. This turned out to be an approach following the pattern used so successfully in Europe a century before. Mr. Ni hired Master violin-makers, and with their help, built a large violin workshop devoted to the handcrafting of string instruments. It was one of the first such workshops the world had seen since the first half of the 20th century. The workshop relies on skilled hands and sharp tools, not on electric carving and milling machines. At the head of the workshop is the small group of Master Luthiers. These are violin makers trained in the European methods of stringed instrument making. Each of these Masters is a highly experienced and talented violinmaker known for producing very fine string instruments . Each is in charge of the production of a specific model of instrument. The Master violin maker trains and supervises the carvers, selects the wood, and oversees each step in the process of hand-crafting. The carvers who assist the Master Luthier are selected from among applicants with experience in handicraft and the use of hand tools. But when they are hired, they are not yet trained violin makers. They are selected only after tests of their manual skills. The Master then trains them in specific violin making procedures. This means that each carver is not a fully-trained violin maker, but more of an assistant to the Master. Jobs in the Eastman Strings workshop are very popular. The pay is high, the work is interesting and requires great skill. Most importantly, the workers learn a valuable trade , resulting in steady employment. 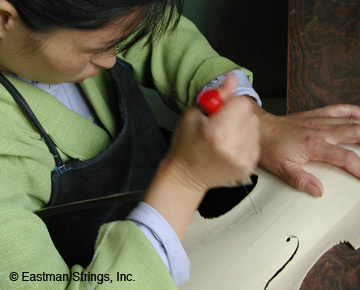 Craftspeople in the Eastman workshop are members of China’s growing middle class. Now that the Eastman Strings workshop is about 12 years old, violin making is becoming a family trade for some families. In the few years since this workshop was created, the reputation of Eastman Strings for the tonal quality and craftsmanship of their instruments has become a worldwide standard . 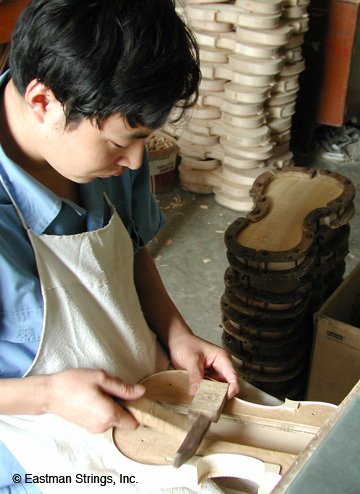 Almost as important as the skills of the craftspeople, are the materials they use to make Prodigy string instruments. These highly skilled carvers go to great lengths to ensure quality at every stage. See the step-by-step process Prodigy uses to build a beautiful, and beautiful sounding string instrument. How can an instrument crafted in China be as good as a European instrument? Performers and teachers agree, Prodigy instruments have more in common with a traditional European instrument than most of those made in Europe today . Delve deeper into the story of Prodigy Instruments and founder Robert Kurz’s mission to bring affordable high quality string instruments to student musicians. How much will I love my Prodigy instrument?Ask those who already have played one, and recommend Prodigy to their students.